Happy Thanksgiving to all of you, wherever you are! I know some of you are in London and planning to run tomorrow. I’ll be at Barclays at 8:30 tomorrow, rain or shine, and I wanted to pass on the potential route for you all to think about. Please don’t think I’m obsessed (although my kids do), but I’ve mapped another Paddington route. It’s almost a repeat of the Big Ben run, but with extra running in Hyde Park that makes it about 5 miles. That may be a bit long, but we would see 6 Paddingtons and end up at the Westminster tube station…and we could always walk at the end if our running is done. 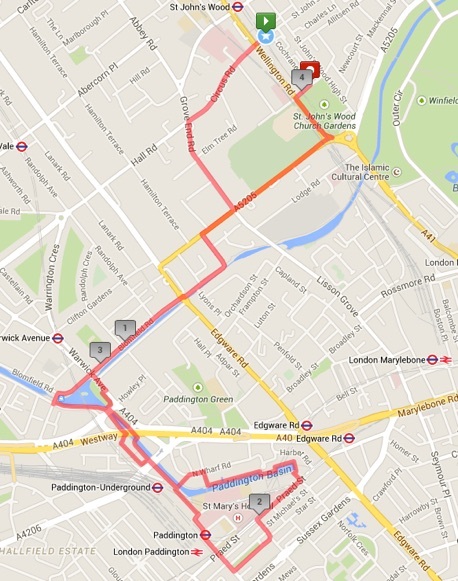 We could also stop at 4 miles – that would take us past 3 Paddingtons and end in Green Park. 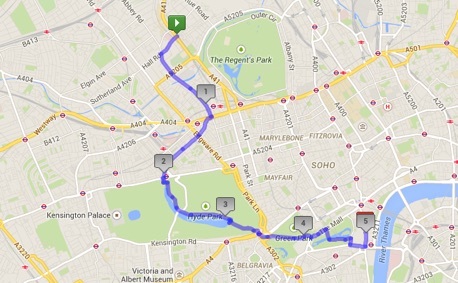 And if no one wants to ride the tube, we can always run to Hyde Park and back (we would still see one bear!). We’ll figure it out tomorrow. And for those of you who aren’t around, I’m more than happy to do either route again! Time for more Paddington Bears! 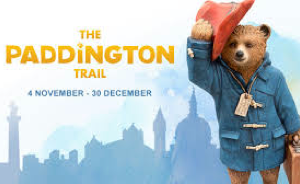 That was such a great run we had on Thursday seeing all the Paddington bears! Thank you Vicky for planning such a fun course for us. This week we will change the start time to 8:30 am given the Thanksgiving holiday. Vicky will be there to lead you on a route to Hyde Park. Please remember to bring along your oyster card as it might not be an up and back run but instead a run in the parks and tube back. The run will consist of three 15 minute intervals separated by 3 minutes of walking. For those of you who haven’t already started doing this, please consider adding a short run on the weekends. There is no need for it to be longer than 30 minutes of run time – either four 7 1/2 minute runs separated by 2 minute walking breaks, or three 10 minute runs, again separated by 2 minute walking breaks. The pace should still be slow, but can be a little faster than that of the Tuesday and Thursday runs. If you don’t like going faster then don’t – you will still reap the benefits of a third weekly run. If you are too tired or achy from the running, then consider a brisk power walk. Lastly, on a fun note, Nancy Leibig has been hard at work finding us a fun venue for a group dinner in December to celebrate all your hard work and the upcoming holidays. We have two possible dates… Dec 4 and Dec 17. Please send me an email and let me know if either/both work for you. At this point in your training program you should start to incorporate a third run each week. Ideally, you should repeat our Thursday run on Tuesdays. Your third run should be shorter than the run we do on Thursdays. For these next few weeks the third run should be about 30 minutes of jogging time out of 40 or 45 minutes of total time (e.g. you could jog 7.5 minutes, walk 2, and repeat that 4 times, or jog 10/walk 2 and repeat that 3 times). Regarding your pace… we have heard from several of you that the pace on Tuesdays is usually faster than the pace of our Thursday runs. This often happens because it is harder to self regulate. If you find the pace to be too fast, slow down, regardless of how fast the others in the group are going. We are training ourselves for endurance right now – speed is not an issue just yet. Naturally you may be feeling tired, but you should not be out of breath at any point. Please let us know if you have any questions as we continue to send along more information each week. Keep up the great work. We are SO proud of all of you!! Congrats on another great week. 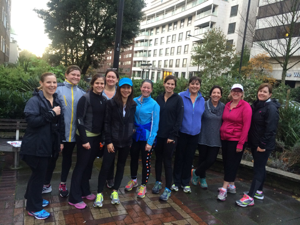 Thanks to Syma for guiding us last week on our beautiful Hyde Park Run. This week Vicky will be leading us into Primrose and Camden. We will be doing one 8 minute and three 10 minute intervals! This may sound like a big jump from the 7s we did last week, but we will be running fewer total minutes, so keep that in mind. You will be totally fine. As we have been discussing a lot lately :-), please take the time to stretch after your runs. You might want to consider buying a foam roller. Please don’t ignore any nagging pain hoping it will go away. It could get worse, and may cause other problems. We have physical therapists and other experts we can recommend to you. Keep up the great work ladies. We are SO proud of you! What a great group we have! Thanks to all of you who were able to attend the coffee last week. It was so nice to have that extra time with you and get to know you a little better. You are all doing really well, and we are right on track with our program. It is very exciting for us to watch your progress. Only a few weeks ago you were running 1 minute intervals and walking more than you were running. You are now running 7 minute intervals! This upcoming Thursday you will be running 40 minutes of the 60 minute workout. Over the next few weeks, you will begin to notice a pace differential within the group. This is totally normal, and to be expected. Every one of us has an individual gait/running style and natural pace. Those with a longer stride or faster cadence should start to migrate to the front of the pack, but please please be sure to run your natural pace. If you are naturally a faster runner, and try to slow down too much, you could end up with knee or hip pain from trying to put on the brakes. We know some of you want to keep running with your friends, but try to resist the temptation if your paces are different. Do remember however that this is not a contest. So don’t worry about where you fall in the group. Just find your own individual pace and stick with it. Bear in mind that because we are looking for endurance, it may still be a slower pace than you feel comfortable with for a short distance. We know that some of you feel that the pace is too fast while others feel it is too slow and want to go faster. It is our job as coaches to keep the running at a pace that will ultimately see you through this program. Also, please remember to take the time to stretch before and after the run – it is very important. Thank you all so much for joining this group. We have really enjoyed getting to know you and are so proud of all of you. We constantly get asked how our ‘beginner ladies’ are doing and enjoy impressing everyone with how well you have progressed! 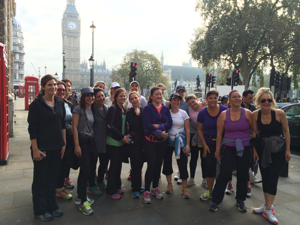 What a fun run – you are all amazing!